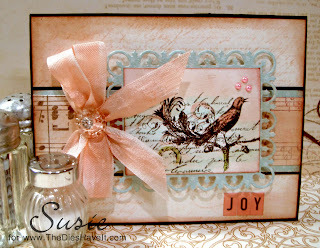 I am entering today's project in this week's challenge at The Shabby Tea Room. Even on the weeks I don't have a project to enter, it is truly one of my favorite sites for shabby inspiration. I don't do shabby well on my own, but I love the look of it and when it is done well, I have been known to swoon! Well, the girls at the Shabby Tea Room never disappoint! Aren't those treats just mouthwatering? To make my card, I used papers that have been in my stash forever so I can't even tell you what they are. But the image that I colored is from Designer Digitals and it is on sale today for 50 cents. It is part of a brush pack. LOVE IT ! I cut the image into a rectangle and then used the Fleur De Lis die for the mat. 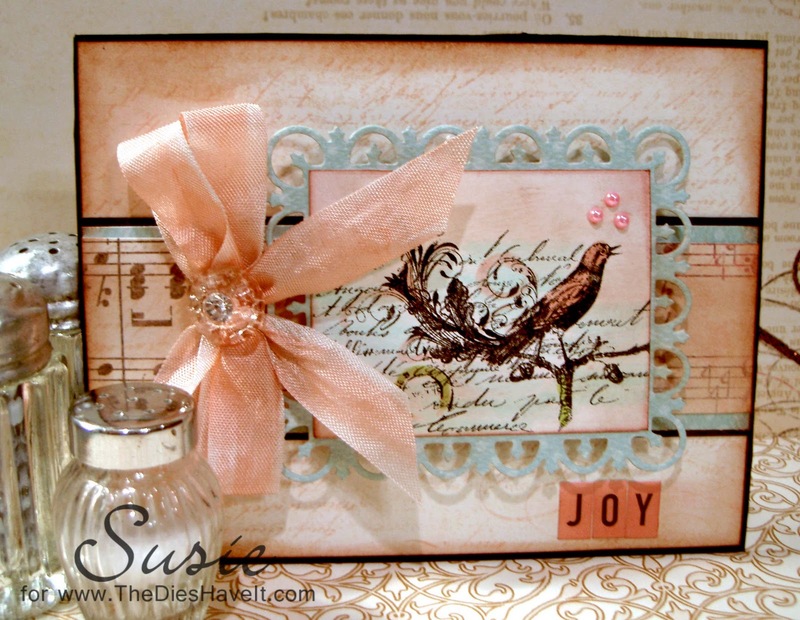 Spellbinders makes the most wonderful dies!! Adding distress ink to everything gave it the shabby look I was trying to achieve. Run on over to the Shabby Tea Room and see all the beautiful entries. And while you are there, you should join in too. Tomorrow I will be back with this week's Cupcake Inspirations challenge. Please come back then to take a look. Gorgeous Card, Susie!! You do Shabby pretty amazing!! TFS!! Take Care! !